My original plan to was to drag some dusty stuff out of the garage and lower my spray paint stash. Arkansas weather in February had other ideas! My project had to be completed indoors! Out came paper, glue, stickers, tape, acrylic paint and water colors, crayons, and markers. All supplies were from my stash. 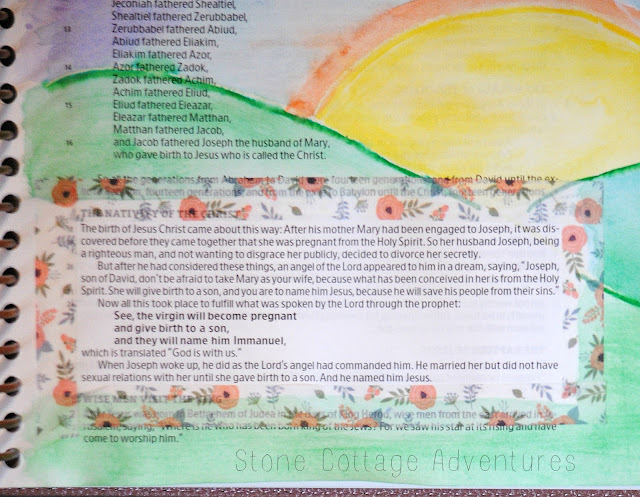 An angel of the Lord appeared to Joseph in a dream... not once, not twice but THREE times! All three times, when Joseph wakes up, he obeyed the directions he was given. Twice he rises in the middle of the night to protect his wife and her child. For whatever reason, this made me think of a rooster. They awaken early and are fiercely protective of their flock. I'd never attempted to draw or paint one before though. 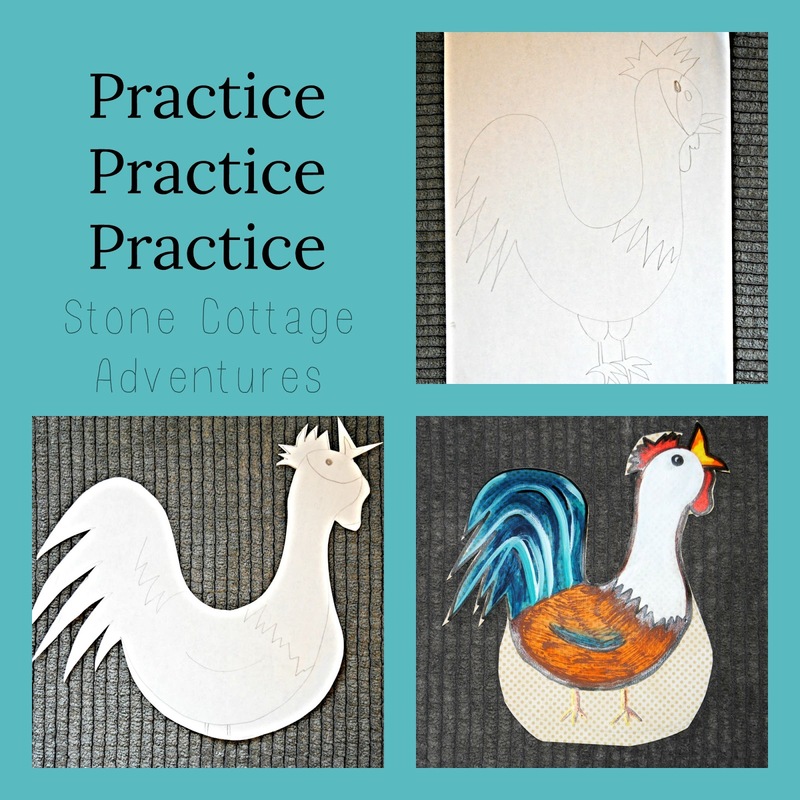 Thanks to THIS POST from The Lost Sock Blog, I learned and I practiced. My rooster painting is held in place on a blank page of my Illustrating Bible with Washi tape and has my notes in the corners. 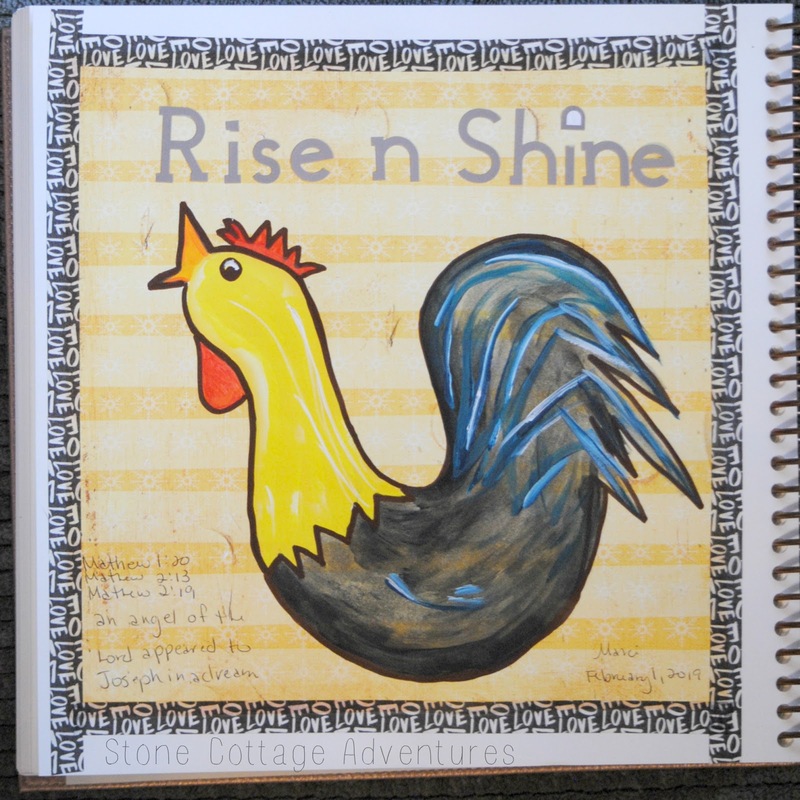 The 'Rise and Shine' rooster is next to a water color sunrise. 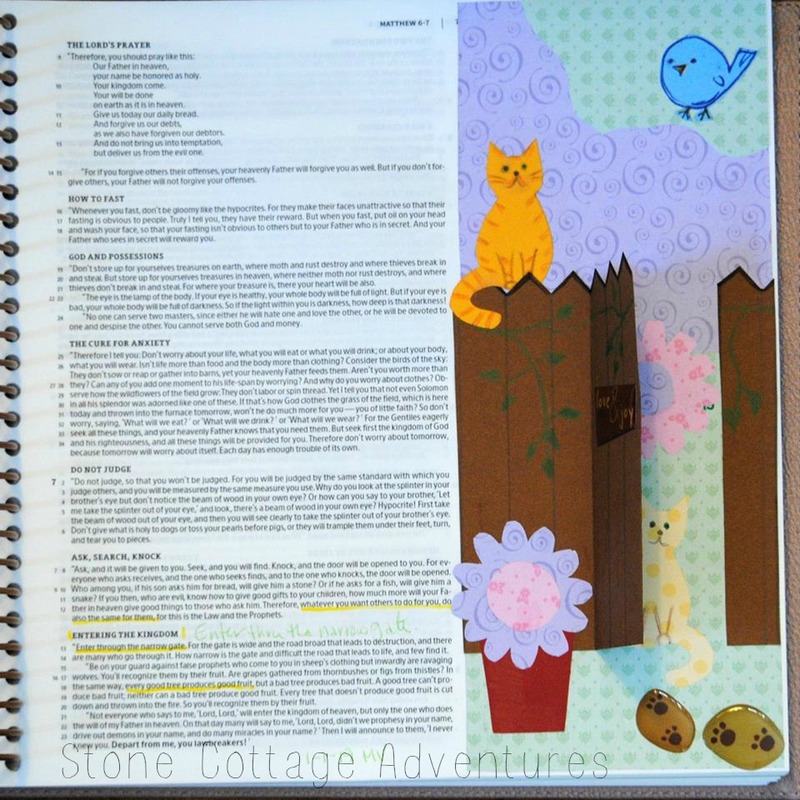 How often do I have a plan, but procrastinate? I feel the message to me in these passages is to Rise and Begin whatever it is I should be doing. Not pin about it. Not post about it. Do it. Matthew 7:13 Enter through the narrow gate... is illustrated with more help from The Lost Sock. 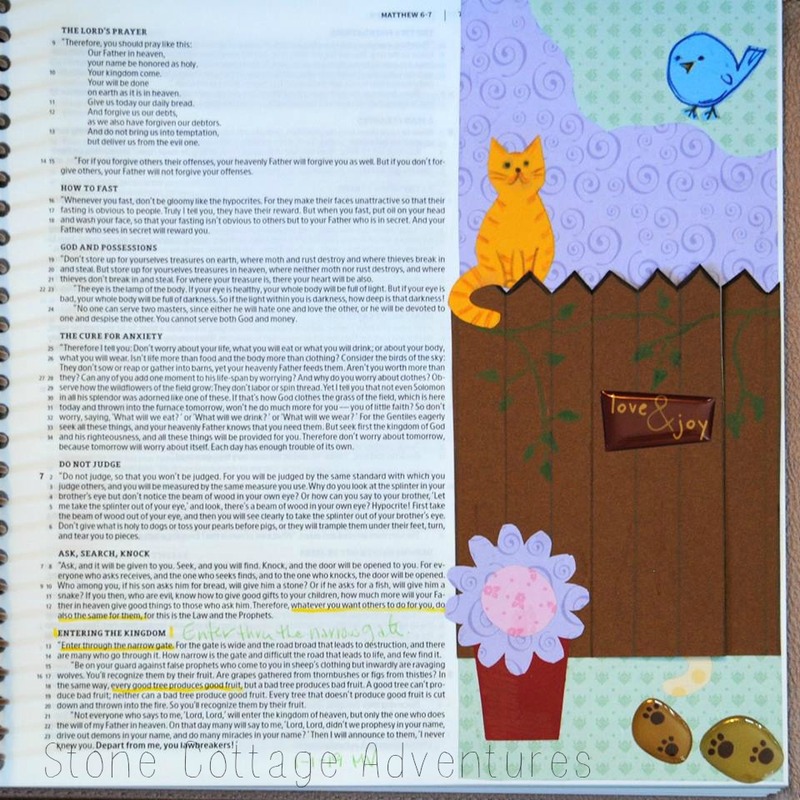 If you'd like to see her art tutorial for a fence and cat, just click HERE. I love that the gate opens for another feline friend! What's in your stash? How do you plan to use it? 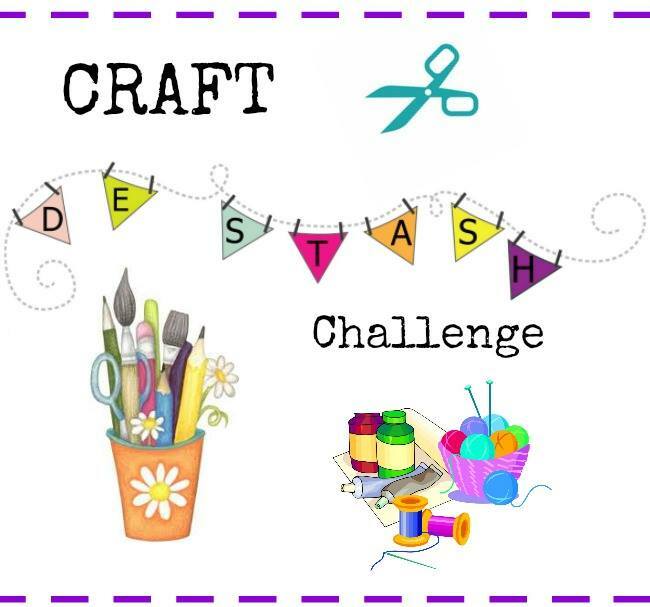 Take a look at everyone's project for more de stash inspiration! It's great that you found a way to incorporate the story into your own artwork, Marci. It looks great. Such lovely illustrations! And what a great reminder! 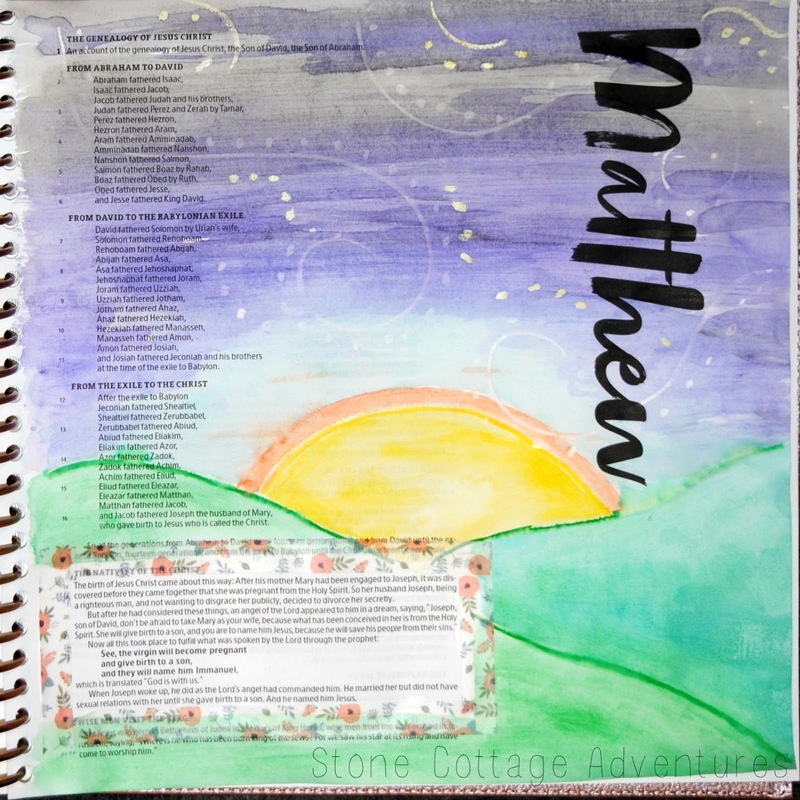 Love your Bible journaling. The mix media and creativity of the art is beautiful. It's beautiful! The weather in central New Jersey has foiled some of my plans this winter too, I did need to do a bit of spray painting in frigid temperatures... space heaters in the garage helped, but it still wasn't pleasant. Marci, I think we've been having weather much like you are this year. Bible journaling is always so creative and beautiful. Love what you did here. Inspiring artwork to go along with your studies! I think this would even help with reflection on the scripture verses and their meaning to you. Beautiful artwork! I really like the one with the cat on the fence.